More simply known as “a pain in the front of the knee”, Anterior Knee Pain (AKP) is a frequent problem in active and sporting individuals. It is not a diagnosis but merely an umbrella term to describe the location of the symptoms and there are several anatomical structures pertinent to this area which can be the cause of the pain. In this blog our Chartered Physiotherapist Rebecca Wyatt outlines the basic anatomy of the knee and some problems which can occur in this area, as well as reasons why the pain may have occurred in the first place. What tendons are in the knee? As shown in the picture above, the menisci (cartilage on the surface of the tibia) can be a source of knee pain. An acute tear and inflammation in this structure can lead to knee pain and reduced movement but often the pain is localised to either side of the patella tendon. 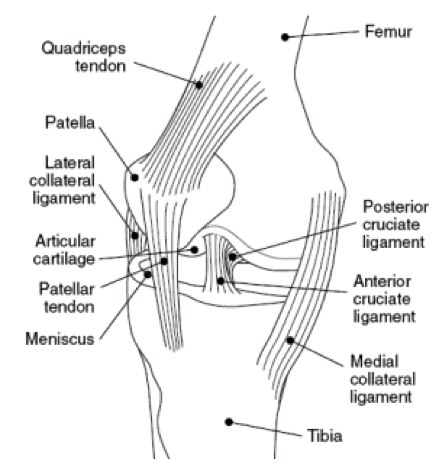 Beneath the patella tendon sits a bursa (fluid filled sac) and fat pad which are not shown on the above diagram. 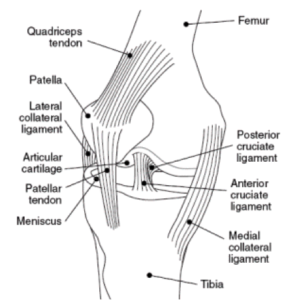 Why might anterior knee pain occur? Anterior knee pain occurs for many reasons. Some people unfortunately suffer with degenerative changes within the knee joint which leads to osteoarthritis a pain. This can happen to anyone as part of the ageing process or to those who have worked in jobs / sports which has place a lot of stress on the knees, for example plumbers who kneel a lot. Pain in the patella tendon often occurs due to a combination of poor biomechanics and weakness in muscles contributing towards supporting the lower limb. This can then lead to increase force being placed through the patella tendon which with repetition and over time can lead to pain. A Chartered Physiotherapist can assess for and treat all of the above knee problems. Your pattern of symptoms, activities which aggravate the symptoms and how long you have had the problem are all important things a physio will ask in your first session. Then your lower limb posture in static positions and during specific movements will be assessed as well as the length and strength of the large muscle groups in the lower limb which can impact on the knee. A specific palpation (also known as a poke and prod) of the knee will follow with special tests to rule out cartilage and cruciate ligament problems. Depending on the findings your physiotherapist will then explain the current problem and devise a treatment plan to address it.